Here are five stories from Oxfordshire which people have been clicking on this week. 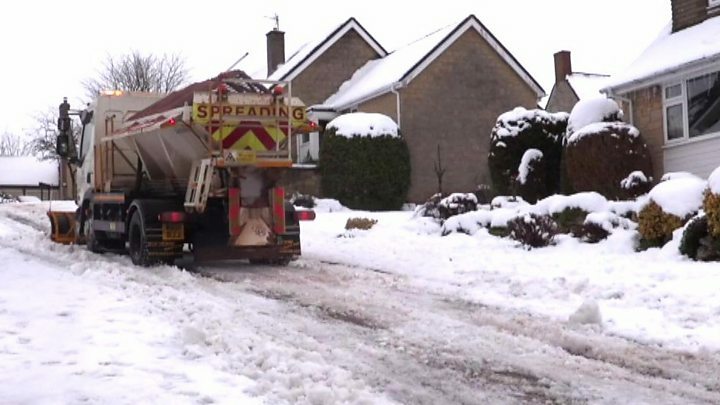 A gritter was sent to clear a woman's street after an on-air radio appeal to the leader of Oxfordshire County Council. Becky Aries asked Ian Hudspeth for help to reach her husband's funeral on BBC Radio Oxford, after heavy snow left her road impassable on Monday. He said he would see if anything could be done and within two hours the council sent a gritter to clear her road. Oxford Brookes was criticised this week after it closed all its buildings for two days due to snow. It used the hashtag #SnowDay to accompany a tweet that said it would be shut on Sunday and Monday. In response one student said: "I don't think #SNOWDAY is an appropriate hashtag... we deserve to know why we have no access to our library." Defending the closure, the university said icy conditions were expected to cause difficulties as more snow fell. A teacher who says he faced disciplinary action after he referred to a transgender pupil as a girl is taking his school to an employment tribunal. Joshua Sutcliffe, from Oxford, says he was investigated after he said "well done girls" to a group that included a student who identifies as a boy. The 27-year-old Christian pastor is now suing the school for constructive dismissal and discrimination. The secondary school previously said it would be "inappropriate" to comment. Cosmetics retailer Lush has said one of its shops - which the firm was criticised for boarding up - can be used as a temporary homeless shelter. The boards were placed outside its premises in Oxford city centre last month after the company closed the branch. This prompted criticism from the Green Party in Oxford as rough sleepers had been using the doorway. After apologising and removing the boards, Lush has now said the shop can be used as a temporary shelter. The People's Dispensary for Sick Animals (PDSA) Dickin Medal was given to a pigeon that flew from the Greek island Crete to Alexandria, Egypt. The 406 mile (653km) flight took place in 1943 and the accolade was awarded to the bird called Princess in 1946. It was sold to an internet buyer by the family of the trainer at Holloway's Auctioneers.